Mix two pounds of lean hamburger with one half cup of Sparky Fire Sauce (adjust to taste), one half cup of finely chopped onion, and let it sit together for at least an couple hours (we like having it sit overnight so the flavors really blend). Before grilling, salt to taste and then grill to desired doneness. We make BIG burgers with this recipe, typically five burgers out of the two pounds of meat. Toast ciabatta buns, bottoms with butter, tops plain (will spread mayo when assembling burgers). Saute fresh, sliced mushrooms. Buy or prepare a well-seasoned cole slaw. Top burgers with pepperjack cheese, then mushrooms, then coleslaw. Optional – pretty darn good with a couple of pieces of pepper smoked bacon on top the slaw portion! I get the boneless skinless chicken thighs from Sam’s club. Like maybe $2/lb. and get about 5 lbs. and coat them with the following rub (this is too much rub for 5 lbs of chicken, but cover it liberally). Smoke in smoker at 250 for 90 minutes with apple or your favorite wood. Take a 9X13 disposable aluminum pan. Place enough chicken broth to cover the bottom of pan about 1/4 inch. Place thighs in aluminum pan and cover with Sparky’s. Foil and return to smoker for additional 90 minutes. Remove, let rest, and shred. Add sauce as necessary. Serve as pulled chicken sandwiches with blue cheese on top. I also use the same thing for chicken legs, and finish on the grill, always gets RAVE reviews. This is a southern tavern with just a bit of a mild kick. You can add more heat by doubling the chili powder, Sparky’s and cayenne pepper and adding a few of the seeds from the jalapeno. You can use beef, too! You can serve these on burger buns, in tortillas or in pitas garnished with with some shredded cheddar, pickled jalapeno slices and chipotle mayo. (If you have a more classic taste, American cheese, pickles and ketchup still tastes good as well! )” Original recipe makes 5 sandwiches Heat the olive oil over medium-low heat; cook and stir the ground turkey, using the back of a wooden spoon to work the meat into small crumbles as it cooks. When the meat is about half browned, stir in the onion, garlic, and black pepper; cook and stir until the turkey is crumbly, evenly browned, and no longer pink. Stir in 1 tablespoon of the prepared mustard, the cayenne pepper, chili powder, and water. Bring the mixture to a boil, reduce the heat, and simmer, stirring, until the water has evaporated, about 20 minutes. Stir in the remaining mustard and the chopped jalapeno, and cook until heated through, about 5 more minutes. Spoon the mixture onto the hamburger bun and top it off with Sparky’s 2 tablespoons olive oil 1 1/4 pounds ground turkey 1 cup finely chopped white onion 1 clove garlic, minced 1/4 teaspoon ground black pepper 1 1/2 tablespoons prepared yellow mustard, divided 1/8 teaspoon cayenne pepper 1/8 teaspoon chili powder 1 cup water 1/4 cup finely chopped jalapeno 1-2 tbls of Sparky’s per sandwich. Place cream cheese in a large bowl and microwave 60 seconds or until soft. Chop celery in to small fine pieces, you can wash and chop the entire bunch cutting of the base. Mix celery, tuna and sauce with cream cheese stirring until thoroughly mixed. Makes approximately 8 1 cup servings. It goes great in sandwiches and wraps or straight out of a bowl. Sparky’s is a good fit for this. 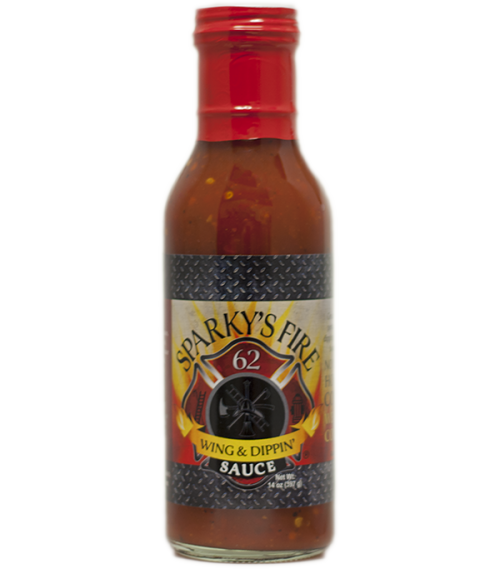 -prepare mix as stated on back of box, add sparky’s sauce to taste. – press waffles in your waffle or Belgian waffle maker. – purchase two types of syrup. one lower end brand and one higher end brand. – mix the two syrups together. 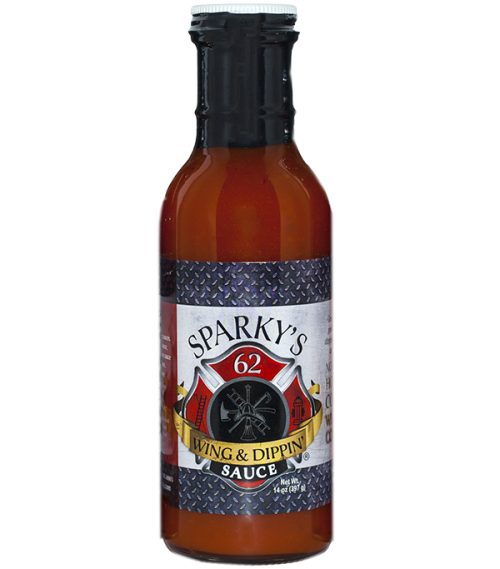 – mix sparky’s sauce with the two syrups to taste. – go to your local store or fried chicken provider and pick up some fried chicken. – or really whatever type of chicken tickles your taste buds. Chop bacon and saute on medium high in bottom of pot with bacon grease and onions. Once the bacon starts browning a little and the onions are clear, add the water, bouillon cube, and Sparky’s. Bring to a slow boil and toss in the greens, then let it cook for about 40 minutes on medium or until desired tenderness. Goddamn! ***The variations in the measurements will be based on how much greens you have, 12-16 oz., taste preferences, or how unhealthy you want it. Submitted my NebraskanBall from the Main Board. Submitted by kyle23 from the Main Board. Makes boring Mac N Cheese awesome. Making Mac N Cheese for the kids just got a lot better.